How did you involve yourself in the 'New Age Techno Communication Campaign' of Narendra Modi? On 24th June 2012, I received a call from the Office of the then Gujarat Chief Minister, Narendra Modi. I was invited to meet the Chief Minister the following day to discuss the evolving trends of the social media. I was then a law student at Pune. This phone call proved to be a turning point in my life and provided an opportunity to learn about election communication strategy. The historical interaction with Modi for 20 minutes still lingers in my mind like a dream. I worked for the Gujarat Assembly Elections 2012 and later got involved in different elections to assist the BJP in different capacities thereafter. 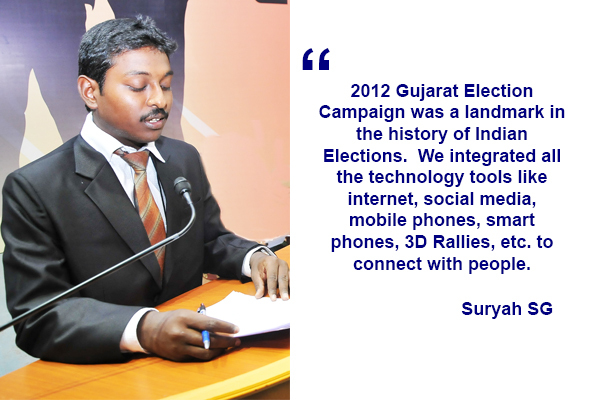 The 2012 Gujarat Election Campaign was a landmark in the history of Indian Elections. We integrated all the technology tools like internet, social media, mobile phones, smart phones, 3D Rallies, etc. to connect with people. What were the strategies planned by your team during 2014 General Elections? In January 2014, Congress MP & Former Union Minister, Mani Shankar Aiyar mocked the then Gujarat Chief Minister Modi as a Chaiwala. Our CAG Team (Campaign Team that worked for Narendra Modi during the run-up for the Lok Sabha Elections 2014) immediately sprung into action and coined a political event, “Chai pe Charcha” (Discussion over Tea) throughout the country. As someone who had organised dozens of Chai pe Charcha events across the country it was a totally new and refreshing experience, interacting with chaiwalas (Those who prepare and serve tea at tea stalls) all over the country, live and through video conferences. We were able to capitalise on Modi being a Chaiwala earlier in his life. While the ground activity was executed by the party workers, the idea to conduct such catchy events came from our strategy team. The importance of the social media is largely underestimated. We normally believe that Face book, Twitter & WhatsApp influence only a particular age group of people. In reality, the impact of the word-of-mouth campaign spreading through these social media platforms is very huge. One WhatsApp user has the potential to spread the message he receives across an entire village. Do the senior political leaders and workers accept a team of youngsters? Political leaders who have toiled at ground level for over three to four decades, do not tend to easily accept the newly sprung up election techno strategists overnight. It takes time for them to come into an understanding that the political landscape in India is slowly turning towards a strategy based activity. These political leaders still do not accept the evolution and adaptation of technology as influential factors in electioneering. Since I had studied law from a premier law school in Pune, I was fortunate to have friends from different political parties studying with me in my college. I had opportunities to interact with strategists from various political parties like the Congress, the Nationalist Congress Party, the Shiv Sena and other small parties during the run up of the Lok Sabha Elections 2014 and the Maharashtra Assembly Elections 2014. Presently, I am also interacting with the strategists for the Assam, Kerala and West Bengal Elections 2016. Everywhere, I find a similar experience cutting across the party lines among the new groups of young techno strategists facing difficulty in being accepted by the old political guards. The seniors in the parties just cannot accept fresh youngsters as potential strategists for the elections. While their worries are totally justified, the recent elections have proven that fresh political techno strategists can walk the talk and give a tough contention to conventional political experts. In one of the state elections where my friends were associated, the local political leadership had a tough time to amend their ways. This compelled the central leadership to come down to the state for two days, camp there and convince the local political set up that these techno strategists were present only for a temporary period till the elections were over. Till such time this assurance was given by the central leadership, this young group of people were treated like bitter rivals. The existing senior leaders feel unsecured. At the same time, I also find that some of the pro-active senior leaders encourage the youngsters by supplementing the knowledge with their own experience and wisdom. What are the skills needed to become a political techno strategist? Anyone who wants to become a Election Techno Strategist should have exceptional skills in using technology tools, and smartness to convert every challenge into an opportunity. The Indian political situation is not yet matured like that of the western countries. It needs immense patience and perseverance by youngsters to get into the political setup and become a real strategist and influence the political decisions of the party. With my experience I can boldly say that it is definitely not a cake walk. Ambitious youngsters aspiring to become a politician should behave in a matured manner, if they take the role of a strategist. Exhibiting the political ambitions openly during their role as strategist will prove disastrous and counter-productive. What is the difference between corporate campaigning and political campaigning? Political campaign is time-based and sprouts suddenly during the election time. Corporate campaigning needs continuous engagement with stake holders through various agencies and PR mechanisms. While corporate campaigning is well established in India, political campaigning will take some more years to stabilise. To cite an example, when our team was working for BJP in the Maharashtra Assembly Elections 2015, we formed a Campaign Team Y4D (Youth for Development). Through this team, we strategised a series of events and meetings to reach the voters. In Pune, hundreds of volunteers wearing the Modi Mask thronged the streets with printed charge sheets on the misgovernance of the state ruling party. Using proper strategies, BJP won the toughest seats. After assuming office as Chief Minister, Devendra Fadnavis invited the entire team for dinner. In the corporate campaigning, the strategy is different. What is the difference in strategies between national elections and regional assembly elections? I worked for BJP in the 2014 Lok Sabha Election and four Assembly Elections. The national elections have a broad perspective, while regional elections are localised. People are smart enough to differentiate between them. BJP which won 7 out of 7 seats in Delhi in the 2014 Lok Sabha Elections, could win only 3 out of 70 assembly seats in the elections held after 8 months. In Bihar, where BJP had won majority during the Lok Sabha Elections failed to form the Government, largely because of the unification of two rivals factors, RJD and JDU. What do you think is the future for the Political Techno Strategic Communication experts? What is the trend among the Indian political parties, both at the national and regional level? India has very few national parties. Congress and BJP have already started to realise the need for proper strategies. As for regional parties, we saw AAP in Delhi & JDU in Bihar hiring professional agencies to handle their campaign strategies. DMK and a few other regional parties in Tamil Nadu seem to have roped in Techno Strategy teams to handle their Social Media and PR assignments in the run-up of the 2016 Elections. 'Political Techno Strategic Communication' is still a grey area; I do not see much scope for aspirants now, unless they have the right connections politically and a proper understanding of the political landscape and culture of the region. It is a difficult area to even risk and venture upon. Those who achieve success in this field will be sure to be successful everywhere. There is no institute or University to teach Strategy. At the end of the day, everything comes down to the individual’s capacity to deal with complex situations with a variety of factors, at the shortest time.